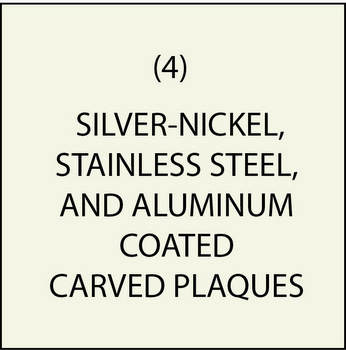 Our carved 3D and 2.5D wall plaques and signs can be coated with a silvery or light gray metal veneer. We use three different metals, each of which has a different color, texture and brightness. These are Nickel-Silver, Stainless Steel, and Aluminum. These have quite different colors than bronze, which is brown to almost plaque, and brass, which has a gold or yellowish color and can be highly reflective. Nickel-Silver, often called German Silver, originated in China, but is known as German Silver .The name "German silver" refers to its development by 19th-century German metalworkers in imitation of the Chinese alloy known as paktong (cupronickel). Our Nickel-Silver coating is indistinguishable from foundry-cast nickel-silver . This impressive silvery metal is an alloy with a content of 60% copper, 20% nickel, and 20% zinc. Despite its name, it actually contains no silver but its silvery metal colour is often used to imitate sterling silver. Nickel-Silver is widely used for house wares, flatware and cutlery, and as the metal substrate for silver-plated goods. It is also used to make Native American Jewelry, musical instruments, including the National Resonator Guitar. Stainless Steel , was invented in the 19th century and is used very widely today for both ornamental and industrial uses. The corrosion resistance of iron-chromium alloys was first recognized in 1821 by French metallurgist Pierre Berthier, who noted their resistance against attack by some acids and suggested their use in cutlery. In 1872, the Englishmen Clark and Woods patented an alloy that would today be considered a stainless steel. Stainless steel’s resistance to corrosion and staining, low maintenance and familiar lustre make it an ideal material for many decorative applications such as wall plaques. The stainless steel alloy we use for wall plaque veneers, is made of about 85% iron and 10% chromium, with small amounts of nickel and manganese. Stainless steel is used in cookware, cutlery, household hardware, surgical instruments, major appliances, industrial equipment and as an automotive and aerospace structural alloy and construction material in large buildings. .Stainless steel is also used for jewelry and watches . It can be re-finished by any jeweler and will not oxidize or turn black. AluminumThe 13th element... the most abundant metal in the Earth’s crust.... low density, lightweight and strong...corrosion resistant... a superconductor... vital to transportation and aerospace... once considered more valuable than gold, Napoleon gave his most honored banquet guests aluminum utensils, the others “had” to use gold.... statue of Anteros atop Piccadilly Circus, London...apex of the Washington Monument...Sleek and clean with a dull matte finish, Aluminum will enhance your project – from exterior building cladding to architectural detail to signage. Unless the LuminOre-coated piece is lifted or placed on a scale to determine weight, LuminOre Aluminum is indistinguishable from solid-cast aluminum. LuminOre Aluminum possesses all the characteristics of foundry-cast aluminum, including texture and finish, and is indiscernible to touch and sight when compared to the solid metal. We coat our HDU and metal plaques and signs with a cold-casting metal coating liquid spray (using a spray gun or airbrush). We use a proprietary blend of real metal particles and a binder (similar to epoxy resin for fiberglass) that we cold-spray onto virtually any substrate, including High-Density-Urethane (HDU) (most common), acrylic, aluminum, and steel, to create the look and feel of solid cast metal. Our metal-coated carved plaques use as a substrate 30 lb/ft3 density (about the density of wood) High Density Urethane (i.e., Precision Board from Coastal Enterprises) for improved polishing and extra durability; this has twice the density and strength of HDU that most other sign companies use for their HDU signs, which has a density of only 15 lb/ft3 and less than half the strength.. The metal veneer has a living finish and will age naturally over time, with nickel-silver eventually acquiring a patina (aluminum and stainless still will not).. The metal coating is applied as part of a proprietary seven-step process by our craftsmen. At an average 10-mil thickness (metal electroplating is less than 1-mil thick), our metal-coating process adds less than four ounces of weight per square foot, provides the durability of solid cast copper, and is non-corrosive. Our metal veneer and HDU substrate has a Class 1-Class A fire rating. Metal-coating is expensive because of the cost of the material ($800 to $1000 for a gallon), and the extensive labor required to hand polish and burnish the metal to a shine (as much as 8 hours for a large plaque). Our metal-coated plaques cost $162/ft2 (retail) , compared to our silver metallic painted HDU plaques with a price of $87/ft2 . Our proprietary metal -coated HDU substrate may be used for on both interior and exterior locations. The metal veneer will not chip, flake, bubble, or peel and will last a lifetime. The veneer is impervious to ultraviolet light, non-corrosive, non-conductive of electricity and can withstand a force of 2,300 psi without detaching from the HDU substrate. These metal coatings can be applied with a patina, spot-polished, or high-polished. Samples of these colors and textures are shown in the photos in M7251 . The variations for each material are achieved by the mixture ratios of the coating material and the amount of polishing on different areas .